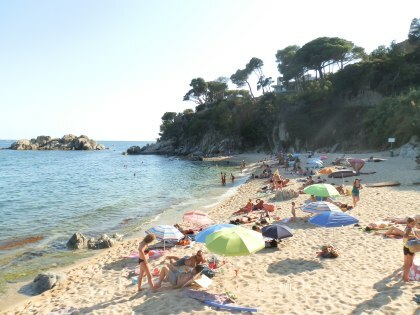 Between Platja d'Aro and Sant Antoni de Calonge (Torre Valentina) - both popular package holiday resorts - the main road runs past a number of four and five star hotels and several large campsites (International de Calonge, Treumal, Camping Cala GoGo). From the road, the area itself just looks like a connecting route as it's not possible to see the coast directly from the road. However, if you stop get out of the car and walk down one of the many stairways between the buildings, you'll find a series of small coves and bays down under the cliffs. These include the large beaches of Platja de les Torretes below Treumal and International de Calonge (under the wooden footbridge), and further down Platja de Bella-dona behind Hotel Cap Roig (four star), Hotel Sant Jordi (four star) and Hotel de les Pis (five star). Further small bays and beaches continue to the south before reaching the main Platja d'Aro beach - these will be added later. Platja de les Torretes is a broad beach with some rocky areas to the north and south and behind it are the fringes of the campsites directly on the beach. Being close to the campsites many of those using the beach are Dutch and French campers. The bay is open but flanked by villas on the cliffs above the beach to either side giving the beach a sense of privacy and sheltering it from the breeze. 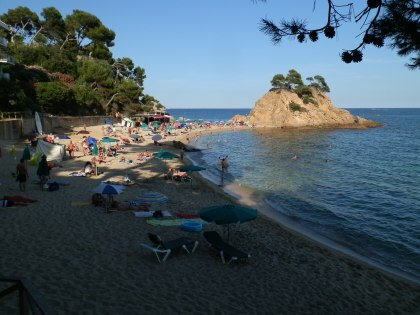 Platja de Bella-dona is a much-photographed, but much smaller beach with a large red rock island at one end (Cap Roig, though not the same as Cap Roig at Calella de Palafrugell). The beach is divided in two via a short flight of stairs over a relatively small headland. These two half beaches are easily connected in the water though with a rocky bay with small islands. This is an area we walked in spring but the GR92 was closed in places making connections between the bays difficult. Unfortunately the GR92 remains blocked between Platja de les Torretes and Platja de Bella-dona. Platja de les Torettes with the campsites behind has a small restaurant at the back and direct connection with Treumal. When we visited it was possible to go out on a banana boat into the bay. The bay itself is marked off and there are pedalos for hire. Platja de Bella-dona is more discreet. There is a chiringuito on the southern half of the beach, but few other facilties. To reach this beach it's a long set of steps down from the road above and you have to find the cut through between the buildings. The bay is much rockier (and so more interesting) and good for long distance swimming. The bay with its islands has quite a number of rocks close to the surface, so you will need to wear goggles to navigate. The sand is on both beaches is coarse but not quite stony, but not really sandcastle type sand. Platja de les Torretes is all sand even into the water and was being used for casual holiday-maker type beach volleyball. Platja de Bella-dona also has coarse sand, but depending on where you enter the water you may find a line of pebbles and rocks, so you may need to walk along the beach to find the best entry point. The bay at Platja de les Torretes is broad and open and shelves quite quickly. The water was clear in general, but a wind had washed some flotsam down towards the rocky parts to the left looking to the sea. Obviously this would depend on the day. Swimming it was a broad sandy bay but not particularly special. Platja de Bella-dona was completely different. The swimming was spectacular as the bay is practically all rocks and there are small islands to explore and plenty of fish. Entering the water you first come on a flat piece of rock - it looks like sand then you step on it and realise it's hard and slippy. Out in the bay are more rocks and crevices and it is perfect for snorkling, or for longer distance swimming between the two halfs of the beach. Many of the beach-goers for Platja de les Torretes come directly from the campsites. For other visitors there can be parking at the bottom part of the wooden footbridge that connects Calonge International to the beach, or parking further down just above the service station. Platja de Bella-dona has some parking on the other side of the road to the hotels or into the estate above this, but it can be tricky at the peak periods. All these beaches are on the GR92 and it is a favourite walk in some hiking guidebooks, but as mentioned above the path remains closed in places which means the occasional link up to the road at the top to avoid the blocakage. It's not a long walk from the main strip at Platja d'Aro (there are buses too).